Titipuchal – Crowd, Multitude – exageration of a large number of messy things or people. Chanclazo – It is used when someone hits another person with a sandal. Changarro – Very Small Busines – President Vicente fox reffered to small business using this word. Changarro – Pequeño Negocio – El presidente Fox se referia así a los pequeños negocios. Cháchara o Chuchería – Little things without much value that you can buy in a flee market. Garnacha – Alimento del grupo de Antojitos, que consiste en una tortilla de Maíz pequeña, frita en manteca, al a que se pone encima frijoles, salsa picante y trocitos de chorizo, papas y carne. Garnacha – Street food made with a fried corn tortilla with beans, salsa, chorizo, potatos and meat. 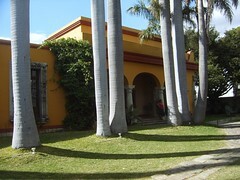 Diccionario del Español de México (DEM) http://dem.colmex.mx, El Colegio de México, A.C., [Septiembre, 21, 2012]. To calm an apettite, a passion, etc. On the other hand the verb Hacer in Spanish can be used as To Do or To Make. For instance in English you say make your bed, make dinner or do the homework and in Spanish Haces tu cama, haces la cena, or haces la tarea. 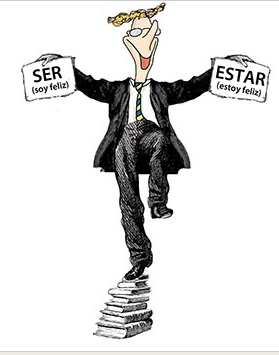 The verb hacer can be used either way as To Do or as To Make. Satisfacer is an irregular verb and it is conjugated just like the verb Hacer, so in Spanish it is not apropriate to say satisfará not satisfacerá which is a common mistake amongst Spanish speakers. If you’ve ever had to exchange contact information with a Spanish speaker, you might know that the name of the symbol @ is arroba. What you might not know, however, is that this symbol is used for way, way, way more than email addresses. If you read informal written Spanish, it’s absolutely everywhere. To explain why, I’ll have to backtrack and talk about some fundamental aspects of Spanish grammar. As you know, Spanish has grammatical gender, which English doesn’t have. A “friend” can be either a man or a woman, but in Spanish, you have to specify if you are spending time with an amigo or an amiga. A lot of folks have dealt with this asymmetry by saying and writing things like amigos y amigas, or amigos/-as. And this is where the arroba comes in! And so on and so forth. It’s also used in contexts where English speakers would use things like “s/he” to be inclusive. A letter from schools to parents, for example, might refer to su hij@ (“your child”) to avoid using either hijo (son) or hija (daughter). That said, this is still a fairly informal usage. It’s more common in email than in other forms of written communication, and the Real Academia Española (an institutional body that monitors the Spanish language) disapproves of this usage, and so it will remain informal for the time being.